Lying South of the Dead Sea, an ancient city in Jordan – best known for its fascinating rock architecture and historical importance – awaits the discovery of thousands of tourists from every nation. 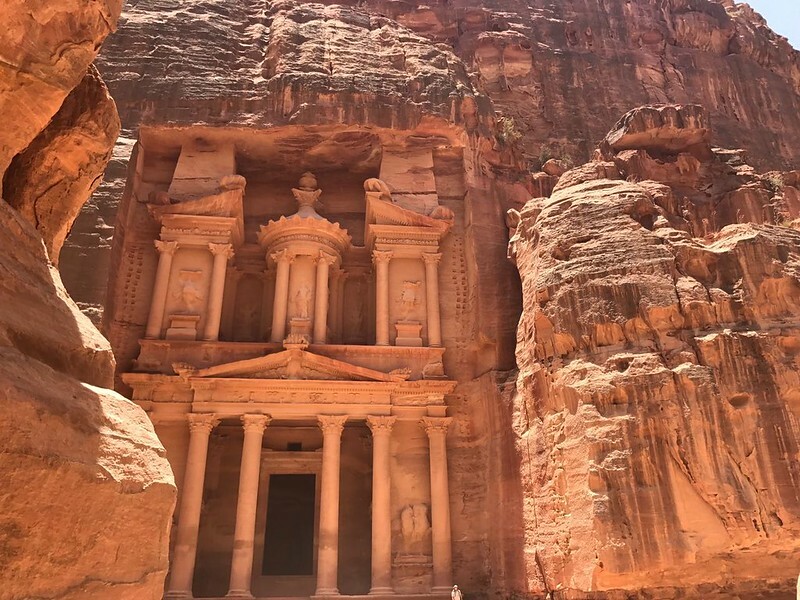 Claimed as one of the Seven Wonders of the World in 2017, the Lost City of Petra is a destination that can only be fully appreciated in the flesh. And so we did. As first-time visitors, we were happy that we decided to opt for a guided tour. If not for our knowledgeable, enthusiastic guide, how would we have ever known that an oddly shaped rock was once an Arabic stone God worshipped for centuries? Starting the adventure with a stroll down a curving gorge formation known as the ‘Siq,’ the entrance of the city was a surreal experience. The twisting Siq’s fascinating rocks have, over time, depicted a name for itself as the ‘Rose City’, which is not only suitable for the rock colour, but an accurate description of the terrain – tough as thorns to withstand the elements, but a beauty of gem when looked closer at. Sand storms and earthquakes may have added a few extra rough edges, but thanks to the skilful architecture, the city’s beauty has been preserved. Leading out of the Siq, we approached the Treasury – Petra’s most magnificent monument and the main reason for our visit. To add a bit of expectation and excitement on our way there, our tour guide told us to keep looking down at the ground as he started counting down from 10. “3, 2, 1… Now!” He knew there’d be a guaranteed awe moment at the end of the countdown when we looked up and stared at the Treasury in all its glory! Seen in multiple films such as Indiana Jones and Transformers, the Treasury has been visited by millions of people over the years, including celebrities such as Hugh Jackman, Will Smith, and Barack Obama. As one of Jordan’s most famous icons, there are not only breathtaking views but also camel rides so that you can get an even better view of the landscape from higher angles. 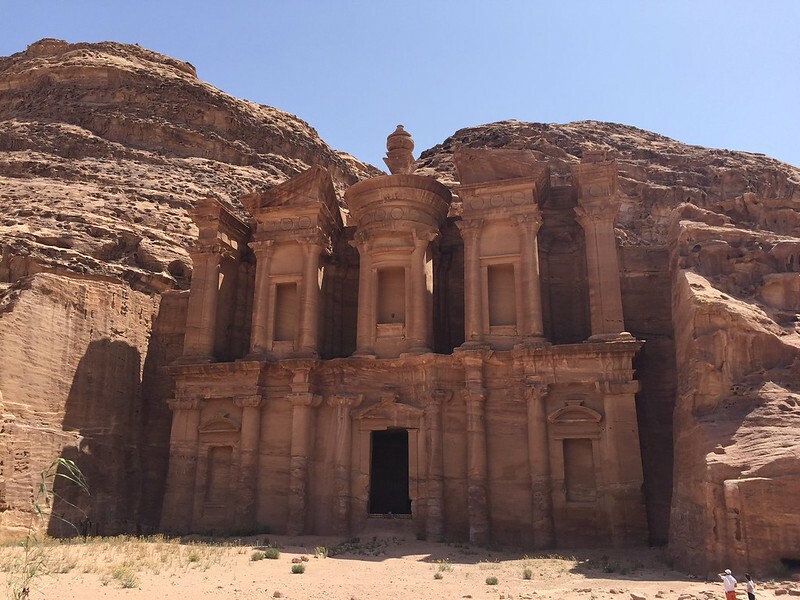 While it seemed like the Treasury was a lovely place to settle in for the day before heading home, we didn’t want to rob ourselves of more thrilling experiences so we continued on the path to open lands of royal tombs and theatres. We paired a viewing of a 2000-year-old rock theatre with our sandwich break – one of the most magnificent sandwich breaks ever. 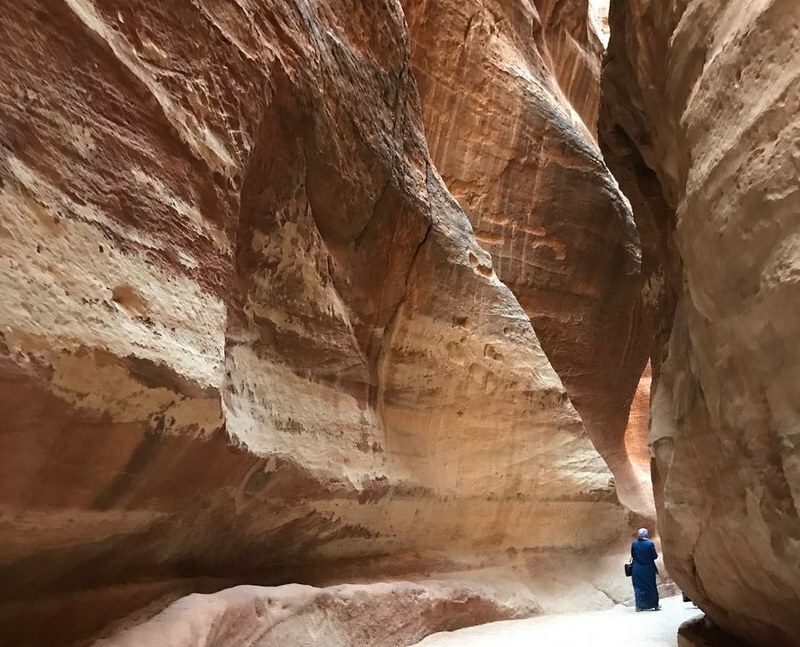 We also used the area for a chance to sit in solitude, take a breath, and quietly survey our surroundings before preparing for a hike to Petra’s largest building. Thankfully, our appropriate clothing kept starting eyes at bay, but we didn’t let the conservative religious rules of a woman having to cover her knees and shoulders dampen our fashion sense. Pairing long, flowing dresses and skirts with sturdy hats and comfortable walking shoes made for plenty of Instagram-worthy pictures (however, a pair of knee-length gym pants could have perhaps added more comfort and flexibility). The Monastery, 50 meters high and 45 meters wide, stands strong awaiting dedicated hikers. Beginning the hike with the right mindset (ready to tackle just over 850 steps) and a camera, was key to actually enjoying the walk. While it was an appealing thought to leisurely ride a donkey up the terrain, we were aware that we’d need to carefully select the owner we wanted to bargain with, as many of these animals are abused and overworked. But in the end, we decided to take time to enjoy the hike on foot instead, interacting with the vendors about their handmade artefacts, buying trinkets along the way for loved ones back home, and making sure we got those perfect camera shots from the top. Petra’s sense of timelessness and its mesmerising landscapes left an indelible mark on our souls. It is a stimulant for the least creative photographer to take award-winning pictures, for the unfit hiker to go back home already planning their next trail walk, or for a timid traveller to book their next flight as soon as possible. This ancient city will leave anyone in awe of the tenacity of the human spirit and with a deep, mysterious wonder about our future. Petra’s Visitor Centre is open each day from 6am to 6pm during the summer and 6am to 4pm in the winter. This is the place to buy tickets, arrange a guide or pick up a Petra map. Please do not purchase any antiquities, be they rocks or coins. There is no way of knowing whether they are real or not. If you can, take a wide lens as well for your camera which will be very useful in the narrow spaces. Don’t forget to wear good hiking shoes and light,loose-fitting cotton clothing, a hat/cap to protect you from the harsh sun. ← Is glamping a “thing”?